Very successfully completed the sale of ReadyCart — the first portfolio company we backed from inception to exit. Here’s what we learned. As a software development firm, we spend our days working to bring our clients’ product vision to life. But every once in awhile, we come up with a really innovative idea of our own. One that we just can’t stop thinking about. When that happens, we use our expertise in product development to turn that idea into a business. Last month, one of our incubated products, ReadyCart, was acquired by Grapevine. While the acquisition was a huge win for ReadyCart and for Grapevine, it was by no means an easy road. In fact, the ReadyCart story started four years ago. Over the last few years, the amount of do-it-yourself (DIY) YouTube and blog content has skyrocketed. And as a result, people around the world are being inspired to try their hand at being creative and are purchasing the products featured in those DIY videos to make it happen. Before ReadyCart, the purchasing process was messy. After consumers watched a DIY video, they often had to manually search for the featured products. Or, if links were provided, they had to go through the checkout process multiple times on different sites. But purchasing wasn’t the only problem. We knew dozens of content creators who were creating engaging and influential content. Some of these creators had hundreds of thousands of followers. Yet, they were receiving very little compensation from the brands whose products they were helping to sell. I love it when a single solution can solve multiple problems, and we believed we could create a product to do just that. We envisioned an ecommerce application that could bundle all those products together so consumers could purchase everything they needed with a couple of clicks. When we began our validation process In November 2013, our team reviewed potential ecommerce APIs to handle the fulfillment side of the business. Because of the variety of content and complexity of the task, we chose Amazon as the first fulfillment option. Within a few days, our team identified a creative workflow that allowed us to quickly drop products from Amazon’s product catalog into a cart, using Amazon’s Product Feed and Checkout APIs. Just a few days later, we had a fully functioning checkout process integrated with Amazon’s checkout API. It was technically possible to bundle products on our platform and pass them through as a “cart” to a fulfillment partner for checkout and shipping. ReadyCart would get paid for sending a sale through to Amazon. Once the basic application was working, we shared it with some YouTube creators and bloggers. The initial feedback was extremely positive. In fact, they wanted to know how quickly they could start using ReadyCart to make money off their content. 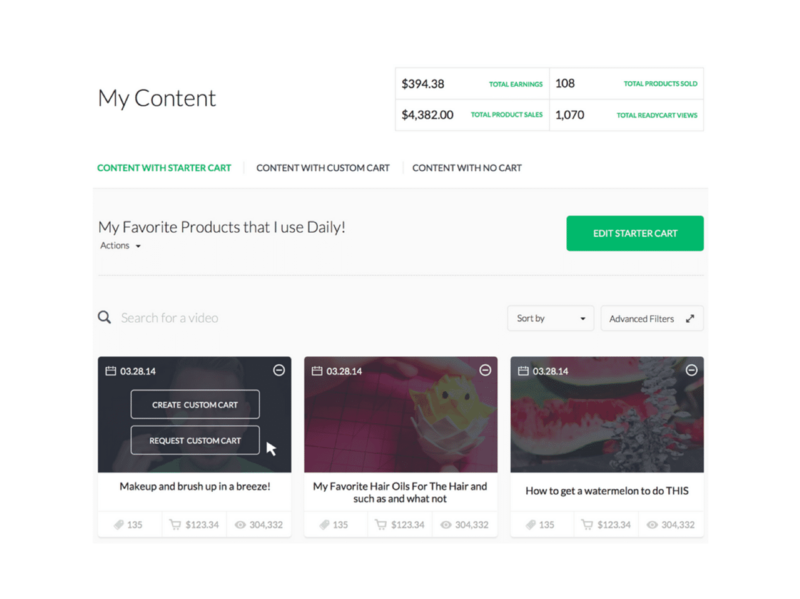 Shortly after launching, we learned that YouTube creators were the content creators most interested in using ReadyCart because of the amount of content and breadth of reach. After bringing on a couple of creators with more than 100,000 subscribers, we realized that we were hitting Amazon’s API limits, and we needed the ability to create hundreds of thousands of Associates IDs so we could attribute sales to the correct content channel. We found the right person at Amazon to help us solve these problems — and he told us that what we were trying to do was impossible because he didn’t think their API was robust enough to support it. But, when we showed him a working version of ReadyCart, he was blown away by the work we’d already done and he fast-tracked us into a beta program that was just getting off the ground. This gave us sufficient API access and Associates IDs. Once we overcame these technical hurdles, ReadyCart could begin to scale and expand marketing to influencer networks (like Grapevine, ReadyCart’s eventual acquirer). A complicated integration with YouTube’s API to automatically “ingest” a creator’s entire video library (sometimes hundreds of videos) so that we could seamlessly update the descriptions of every video. A crowdsourcing application to customize our carts with products mentioned in each video. To do this, we created a custom integration with a phenomenal company called CloudFactory (whom we can’t recommend highly enough). A deeper integration with Amazon’s API to report conversion metrics to the creators and their networks. The creator dashboard allows users to create/remove carts and track metrics. Once a pilot contract was signed with influencer networks, our beta testing group grew to about 40 creators. Traffic quickly increased from 10,400 to 40,000 visitors per month. It was clear that it was time to put an administrative dashboard in place for the influencer networks so that they could see, at a glance, which creators had the highest converting videos (among many other metrics). This became an important tool for networks to demonstrate the power that creators have when it comes to influencing purchasing decisions. 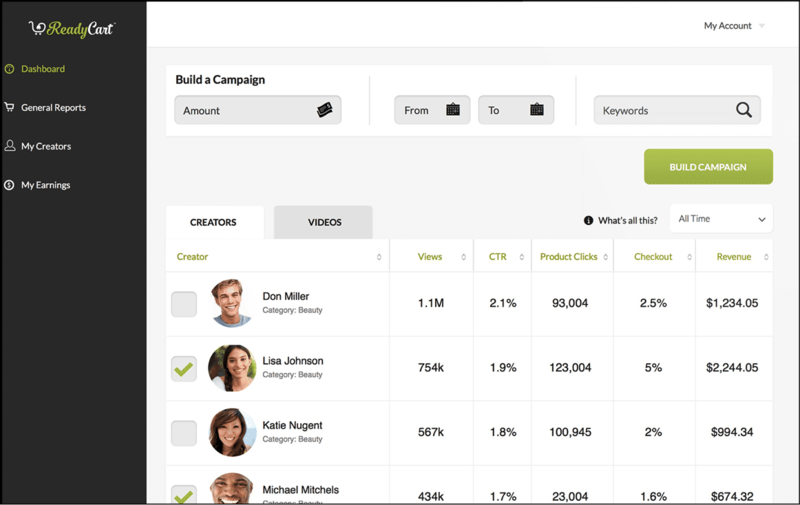 Dashboard view for influencer networks to view metrics across creators. In order to scale ReadyCart to the point where it becomes an industry standard, we needed the reach of an existing influencer network, and Grapevine was a natural fit. Earlier this year, Grapevine acquired ReadyCart with the intention of rolling it out to their network of over 135,000 YouTube creators. They will continue to invest in the platform in some really awesome ways. You can read more about that here. We’re excited for its future with Grapevine, and we’re rooting for them as they help every type of content creator to make a better living through their influence.